I really enjoy cooking. There was a time when I didn’t enjoy it — but that was then, this is now. I’m the kind of cook who uses a recipe only as the most general suggestion or guideline of how the preparations will proceed. If it is a new recipe, I will probably follow it more closely the first time — but maybe not. I improvise a lot — substituting ingredients, changing things up in the seasoning department, and generally managing to invent something that bears only slight resemblance to whatever was on the page. My cooking style continually frustrates my friends who ask for recipes. “I don’t really have one,” I say sheepishly, as I watch them roll their eyes again. For the open house last weekend, I had planned to purchase some of those wonderful little appetizer quiches that you can get at Costco. Well, they were out. So I decided to make them myself. 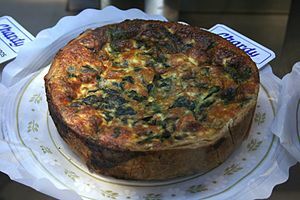 I found several recipes online for mini-quiches you can make in a muffin pan. With a bit of mix and match, I combined the best features of each into a recipe that made sense to me. One recipe had very few eggs, but almost three cups of milk and cream, along with cornstarch to thicken it up. Another had more eggs, less liquid — that seemed like a better idea. The original recipe also called for shallots and zucchini. I used onions instead of the shallots, and for another batch I used broccoli instead of zucchini. Added a dash or two of Tabasco sauce, and took one suggestion to put cheese in the bottom of each muffin tin so that a crust was unnecessary. The finished product was tasty and satisfying. You couldn’t eat just one! A recipe is a great place to START. For me, it is rarely the final word. Over a lifetime, your own preferences and techniques are sure to emerge. A little more garlic, a little less salt. No onions for this friend, vegetarian version for that one. Double the recipe to make enough sauce. Learning occurs each time you return to the recipe, so that you can make improvements that suit your tastes and circumstances. This applies not only to cooking, but also to most other kinds of instruction and learning. Moshe Feldenkrais was interested in learning. Not the kind of learning that seeks to produce a standard experience for everyone, but learning in which each person can develop and express their own individuality. The Feldenkrais Method has lots of “movement recipes” to experiment with and improvise upon, to re-awaken your appetite for movement and life. We have some ingredients you might not have tried before, or have forgotten about. You’ll be delighted with the results! Have you had a recent experience at a Feldenkrais class that you’d like to share? Tell us about it in the comments. Crustless Mini-quiches for simple breakfast. This is a “mash-up” from several sources. Feel free to vary the recipe to suit your own tastes or whatever you have in the fridge. You can use a standard size muffin tin, or a mini-muffin tin. Do not use a large muffin size — you might as well just make one big quiche in a normal quiche pan. a large zucchini, ends trimmed, grated. You want a heaping cupful. Can use broccoli, finely chopped, if preferred. Whisk together the eggs, cream, salt, pepper, nutmeg, and tabasco if desired. Combine well until it looks even and smooth. You can use it immediately or refrigerate until the next day. If you use it the next day, whisk it again. Prepare the veg mixture: In a non-stick pan, drizzle some olive oil and heat to medium. Add the garlic and shallots (or onions) and saute until fragrant, about 2 to 3 minutes. Add the grated zucchini, stir until just starting to soften, about 3-4 minutes. Remove from heat. Oil muffin tins well.. Put a pinch of grated cheese in the bottom of each muffin cup, cover with veg mixture (about 1 tsp for minis, about 1 Tablespoon for regular-size muffins). Add a pinch of fresh basil. Pour some of the egg mixture into each muffin cup, distributing evenly. It will be about a Tablespoon for minis, fill regular tins to 3/4 full. Top with leftover cheese, if you have any. Bake in 450 degree oven until the quiches are puffy and start to turn golden, about 15-18 minutes. Let cool for 10 minutes. Then, carefully run a paring knife around the rim (and interior edge) of each muffin cup. Carefully lift each quiche out of its cup. These can be served hot or at room temperature. They freeze well, too. Let them cool, then freeze in a covered container or in a freezer ziplock storage bag. Reheat frozen quiches on a cookie sheet, 400 degrees, 5-10 minutes. Variations: vegetables you like, in combinations you like; different cheeses (should grate well); different herbs you like (just be sure to use fresh!). You could add crispy crumbled bacon, salami, or prosciutto, or ham, Canadian bacon.